Nebraska Athletic Director Bill Moos met with the media Wednesday and made one thing very clear: Nebraska did all it could to play last Saturday’s canceled game against Akron before the Zips left town. “Scott [Frost] felt like he wanted to play and the players wanted to play and that was the message I was getting on Sunday,” Moos said. “That had a lot of challenges to it but we did have Akron here, we did have the officials, we could have gotten a TV window on FS1 and so there were some positives there. Moos ran down his conversation with Akron Athletic Director Larry Williams on Saturday. Williams and Moos discussed the idea of playing the game Sunday morning and initially Williams was receptive. He told Moos “we’ve got the charter” and felt confident about being able to find rooms for the team. Moos left the press box to go down to talk with the team and when he came back, Williams’ confidence was gone. Nebraska didn’t have rooms either until the football operations staff pointed out there was dorm space available on campus. Moos said the beds weren’t made and the heat wasn’t on, but Nebraska started preparing the rooms for the team to stay in and secured catering from Marriot for a pregame meal. When Williams told Moos Akron couldn’t find rooms, Moos offered up the Huskers’ instead. “We offered those dorm rooms and that catering,” he said. “That would have necessitated our players going back to their dorms, apartments, homes, whatever and sleeping in their own beds which, I think the character of our guys, that’s OK but it’s not the norm in major college football. Moos called Williams a “classy guy” and made sure not to throw any shade at the Akron program. 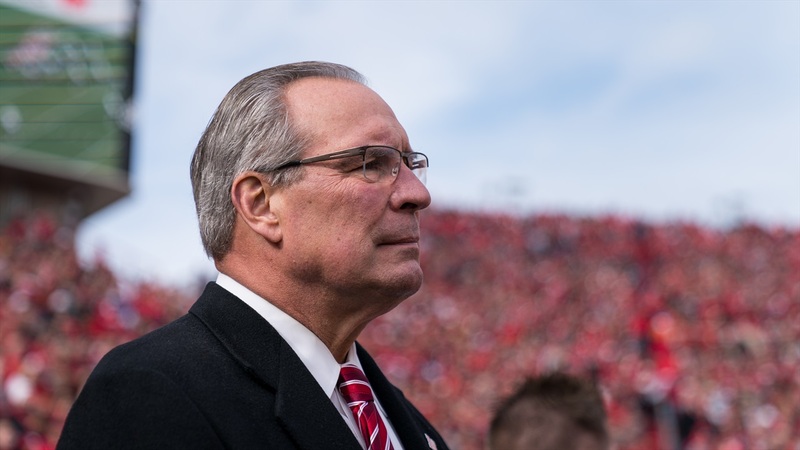 When asked about the $1.17 million payout owed to the Zips, Moos said the Huskers would “for sure” reimburse expenses but the rest of the money isn’t due until March 1 anyway, so no checks have been written. First, they need to see if the game is going to be played. Moos said rescheduling the game for Dec. 1, the Saturday after the regular season ends, would be the preferred option but that would require a wait-and-see approach. The only way that works is if both Akron and Nebraska miss their conferences’ championship games. Akron went to the MAC title game last season. Because of that, Moos said fans have been told to hold on to their tickets because when a 12th game is set, those tickets will be reissued. There won’t be refunds, but if you had a ticket to Saturday’s game, you’ll have the ability to go to the rescheduled one. Asked about a possible neutral site game in Kansas City at Arrowhead Stadium, Moos paused, deadpanned and said, “Against the Chiefs?” Neutral sites and road games appear to be an absolute last resort as the Huskers weigh their options. Another option is Iowa State, who also had its season-opener on Saturday canceled due to weather. Cyclone Athletic Director Jamie Pollard was asked specifically about Nebraska this week and Moos was asked about Iowa State. The team is also discussing filling its bye week with a game on Oct. 27. Moos said that game would likely feature an FCS opponent. “We’re good there because we don’t have an FCS school on our schedule so provided they qualify through the number of scholarships required through the NCAA, we could count that as a win if we were to decide to go that direction,” he said. The current list of FCS teams with an open slot coinciding with the Huskers’ bye is as follows: Elon, Richmond, North Alabama, Bethune-Cookman, North Carolina A&T, Duquesne, Tennessee State, Bucknell, Samford and Abilene Christian. Moos said it’s early in the process so he won’t be throwing out any specific names, just saying that “we’ve got some” on the radar.